This woman feeds a stray dog everyday, so now it brings her a present each day as a thank you. 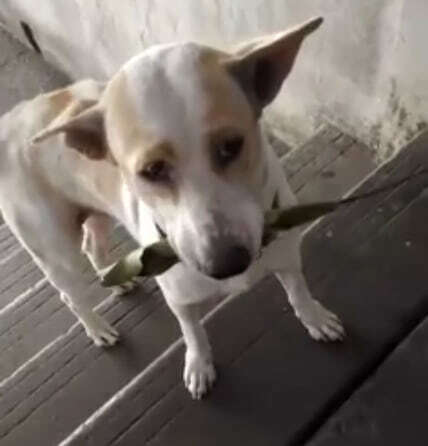 One of the female dogs started showing up with a pup in tow – which she named Tua Plu – and bizarrely, before he tucked into his humble dinner of rice, he would always give her a gift. When he’s hungry, he will offer something to get fed. Every day he shows up with an object in his mouth — usually a leaf and sometimes a piece of paper. Before you feed other dogs, you have to feed Tua Plu and his mom. Touched by little Tua Plu’s sweet offerings, she filmed him to show the world just how cute strays could be. The video shows the pup bringing a leaf downstairs and placing it in front of his food while he waits for approval from his provider. As soon as he’s sure she’d spotted his gift, he adorably gets stuck into his grub. What an absolute cutie. Who knew dogs could have such good manners?